As a mother, you work hard 24 hours a day, seven days a week to support your family emotionally. According to Census and Bureau of Labor 2009 statistics, over 5 million mothers are stay-at-home moms. If you are part of the 71 percent of working mothers, you also provide financial support. 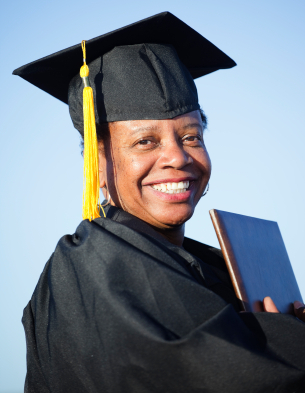 For an increasing number of mothers, obtaining a college degree is a way to better their financial situation. Across the U.S., mothers are finding it difficult to attend college or restart an interrupted college career. This is especially true for single moms, who most often struggle to make ends meet and must work one, sometimes two jobs to support the family. The difficulty may be in finding the time, the money, or the confidence to enroll in college courses. And in today’s current economic struggles, keeping a job becomes more important than a college degree. Yet studies have shown that a college degree improves your earning power. If a parent is able to afford a college degree, chances are it will financially benefit herself and her family. This leads to the problem of covering the costs of higher education. The College Board estimates that it costs a resident undergraduate student an average of $7,605 per year to attend a four-year public institution in the 2010-2011 school year. Obtaining a graduate degree would be considerably more. Depending on how much school you have to complete, the end total can be a bit daunting. Choosing to return to school once you have a family is a difficult decision. Working mothers will need to juggle time for classes and study on top of their work hours and time with their family. Moms who don’t work may look at the family budget and think it is not financially possible to attend college. Where they live or work will also limit mothers to schools nearby. The nearest schools may be more expensive, or may not have the desired degree program. This forces moms to look at more expensive online degree programs. But now that you have made the momentous step to better yourself through a college degree, don’t let the growing financial burden of an education stop you dead in your tracks. What is sadly overlooked, especially in our current economy, is the availability of scholarships and grants available to prospective students. There are grants available to moms who are seeking any degree – from two-year professional degrees to graduate degrees, whether online or in a classroom. You need to enroll in a degree program before you can apply for this free money, which may seem like putting the cart before the horse, but your education is worth it. While the money is out there, the reason this resource is often overlooked is because it takes time to locate and research many of these opportunities. There are three important places to search for available grants: the federal government, your state and local governments, and private businesses and non-profit organizations. Once you have found a grant that matches your needs, you then have to apply for it, and this requires patience and good marketing skills to obtain these grants. The U.S. government provides the largest portion of financial aid, although a significant percentage is in the form of loans. There are four grants that the federal government offers. While these grants are not specific to mothers wanting to go to college, they are the easiest to apply for. In order to take advantage of federal aid, you must complete the Free Application for Federal Student Aid, or FAFSA. The form is available at your college’s admissions office or by filling in the application online. Pell Grant – You apply for Pell grants through your FAFSA application. These federal grants are awarded to those students in most financial need. Single-mothers have a high chance of qualifying for this government grant, as well as single-income family households that are considered low-income. The amount you receive will depend on your financial need, the costs to attend your school, whether you are a full- or part-time student, and if you plan to attend school for a full academic year. The maximum award amount for the 2011-12 year is $5,550. Federal Supplemental Educational Opportunity Grant (FSEOG) – This program is similar to the Pell grant in that it is awarded to undergraduate students with the greatest financial need. Recipients of Pell Grants who had the lowest expected family contributions are considered first to receive this grant. Again, single mothers and mothers in low-income households are strong contenders for this grant. The award is between $100 and $4,000 a year, depending on need, when you applied, other funding you receive, and your school’s financial aid policies. have at least a cumulative 3.0 grade point average (GPA) by the end of the first year of the degree program. The Academic Competitiveness Grant offers $750 in the first year and $1,300 for in second year. However, when combined with the Pell Grant, the ACG cannot go over the total cost of attendance. Also, if there are more eligible students than money allotted for full payment to each student in the year, then the award amount for each student will be less. The National Science and Mathematics Access to Retain Talent Grant – Also known as the National SMART Grant, this is basically a continuation of the ACG. Moms with a knack for numbers can take advantage of this grant to study for careers in healthcare, engineering, or technology. It is available to students who are in their third and fourth year of college. It holds the same eligibility requirements as the ACG but who are in their junior or senior year and majoring in science or math related fields, or in a critical foreign language program. This grant awards up to $4,000 and the same caveats as the ACG apply. TEACH Grant – Moms may gravitate toward careers that allow them to work with children. This grant provides up to $4,000 per year to students who intend to teach in elementary or secondary schools. The conditions of this grant are that you complete a course of study that is considered a high-need field and that you agree to teach full-time in a school that serves low-income students. When you fill out your FAFSA, have your financial aid councilor at your college assist you in applying for these additional grants. As hard as it is to believe with many state and local governments experiencing large budget deficits, money is still set aside for grant funding. For example, Washington State’s Opportunity Pathways Program offers scholarships and grants to students based on financial need and those studying in shortage areas such as math, science, and healthcare. The Georgia Student Finance Commission offers the HOPE program to provide scholarships and grants to Georgia students. Visit your state’s government to find information on grants and scholarships. The U.S. Department of Education also has a resource listing by state that may help you. Large businesses such as General Electric, Adobe, Macy’s, Ford, and Target provide scholarship opportunities through a separate foundation or partnering with non-profits that support their mission. Look to large companies in your area to see if they provide funding opportunities to individuals for education. Most often these companies provide grants directly to your local college and you apply for them at the financial aid office. Most non-profit charities and foundations provide grants to other non-profit entities rather than to individuals, but there are a few that offer grants and scholarships to students, like the Jeanette Rankin Foundation and National Medical Fellowships. Organizations that provide grants and scholarships specifically to mothers are the Patsy Takemoto Mink Education Foundation and the Women’s Independence Scholarship Program. While not specific to mothers, the American Association of University Women (AAUW) offers a Career Development Grant that will help pay for dependent care. There is another often neglected place to find information on available grants and scholarships. Your chosen school’s financial aid office doesn’t just handle the FAFSA. It also has information about any available financial aid opportunities for attending students. Depending on the school, the resource center may have computers to access databases to search for scholarships and grants, or binders of open financial aid opportunities that would also include work study and internships. It is an indispensable resource to find funding for your education, so don’t overlook this source of available grants and scholarships. Business grants are another avenue mothers may explore. Although not directly tied to education, some business grants allow funds to be used for education purposes in order to start or improve a business. Stay-at-Home moms can become Work-at-Home moms with the help of a business grant. Start with your Small Business Association branch office or visit their Office of Women’s Business Ownership website. Searching for financial aid online can lead to some questionable websites. It is easy to get overwhelmed by the amount of information you find. And while there is no doubt that you are a smart person, it is very possible that you could become one of the thousands of people each year who are scammed out of many millions of dollars. Some search sites, such as FastWeb, ask for personal identification to help find the best scholarships and grants that match your goals. If you visit a site that requires such information, research it thoroughly before giving out any personal information. Any site that requests your social security number, bank information, or a credit card right from the start is most likely a scam. Be aware of sites that “guarantee” a scholarship, since the only guaranteed aid will come from loans. Just because a site looks legitimate does not always mean it is. There are sites that require a fee to use their services, either to search or to help you apply for financial aid. But an important thing to remember is that you should never be charged to fill out a FAFSA. There are legal sites that offer search software for a fee, but it is far better to visit your college’s Financial Aid office and use their resources instead. If you are unsure about a site, or you choose to pay for a search service, check it out first by contacting your local Better Business Bureau or the state attorney general’s office. Once you have found grants that fit your description, you need to apply for them. This is where salesmanship comes into play. Almost all grants require a short essay explaining why you think you are deserving of the grant. The base of the matter is this: what will an education do to better yourself, your family and your community? Each grant source has different requirements and deadlines, so read the instructions carefully. Following directions will be an important decision factor when grantors review applications. Have a clear statement of purpose in your application. Know what it is you want to accomplish with your degree. Tailor your essay response to match the mission of the group that is offering the grant. Grantors want to know that their money is going to someone who will make an impact on society. There are three things you need to keep in mind when completing a grant application. Read the rules and requirements carefully. Grant providers set these criteria for a reason, and it is a waste of your time and theirs if you apply for a grant you do not qualify for. Give yourself extra time to complete the application so that you can address any last minute problems that need to be addressed by the deadline. Lastly, have a second set of eyes look over your application to check for spelling, grammar, and clear statements; if the application reviewer cannot understand what you wrote, you won’t get any consideration. Once you have completed and submitted your application, all you have left to do is wait for the verdict. Keep in mind that you are competing with other savvy college students who have also done their homework. But motherhood has taught you to persevere, and with a little help you can shine through the crowd. You may not win the grant the first time, but that does not mean you can’t apply the next time. Don’t give up or get discouraged if you start to feel overwhelmed. Continue to work for that degree so that new opportunities will open up to improve your family’s financial stability. Hello! I am a single mother of two young children and currently enrolled in a Radiologic Technology program provided through our local hospital. I am unemployeed and in desperate need of a grant to be able to continue my education. I have looked at several websites and have a funny feeling that many of them are scams. I do not feel comfortable giving all of my personal information not knowing for sure what the outcome will be. Just wondering if you have any suggestions. I’m a single mother of 2. I’m trying to better myself and am going back to school. My state will help with child care but refuses to pay for all of it leaving the balance of $280.00 per month for me to pay. I had an injury and do not have a job. I’m going to be a full time student. I have no income from any source and REALLY need help. I need a grant to help pay for my child care balance and get a cheap car for transportation. I want to get a degree to get on my feet and have a good job. I’ve tried several sites and just keep getting transfered or a run around. Can anyone help me? I need to figure out how to get the grant to help and am frustrated at the dead ends. try looking into a state funded program that helps with childcare. I know the state of Indiana has the CCDF- Child Care Development Fund program. I have used this program to help pay for childcare and out of roughly 300 dollars a week i have only payed 30. Hope this helps i know every state is different but it is worth looking into. I don’t understand when a single black woman wants to work can’t find a job, does’nt have a car, or something else is happening. In today’s world it seems that foreigners get everything. School paid for, all the jobs and all the free money. I just want to help me and my non verbal autistic son, I will walk to school if I can get it paid for in my neighborhood. I am not a fat, lazy, american! I have been looking for employment for a whole year this is ridiculous, I have received money from California to get my son’s ABA classes paid for that is Ridiculous! Especially seeing that I live in Georgia. I am thinking of moving to California since I can’t find help here in Georgia but I need money and a good place to live first. I understand what you mean. I have a shortfall in my financial aid and unable to finish my bachelor’s program unless I pay for it out of pocket. The balance is around $12,000 left for online. I am only 6 classes away from graduating. I also have an 18 year old son and undergoing testing for a liver transplant. The doctors have me out of work and I have no car because it broke down. I catch the bus everywhere I go take 7 different medications and was attending school online. I’m tired and frustrated I have filled out information for scholarships but what is $1,000 going to do for me? My stress level is high and I am in year 2 of waiting on my numbers to get bad enough for me to shoot to the top of the list for a transplant. Right now I am at the bottom. To some that seems good except the doctors still won’t let me work. So it’s bad for me. I want to just accomplish something, and obtaining my bachelors degree and a new liver would just be the icing on the cake. I have looked on many sites and the information is the same and I can’t take out a loan, I have no money. Frustrated! I too am a single mom returning to college to finish getting my AS. I went to the programs at the college first. They know where to get the aid. I am receiving the Pell Grant plus the BOG Board of Governors grant. It paid for my tuition except 17 dollars of it. I got grants from the Cal works at the college, EOPS AND CARE PROGRAMS that covered the cost of all of my books and $285 in supplies. Plus the gave me a backpack with some supplies in it. They also gave me meal vouchers for the cafe on campus. Next my financial aid counselor and I will start applying for some external grants. I have not had to pay anything out of my own pocket yet. I am also going to be working on campus under work studies program. The last time I attended was in 1997 and I paid for everything. Due to health I cannot do all the things I used to do which is why I returned for my degree so I can get a job that pays more then minimum wages. I just need to know if I can get assistance with a job or school because I am tired of being unemployed and broke. Let me know what you can do asap! I am a single mother of 2 attending college in central Mass,going for my Associates in medical Assisting.My oldest son is autistic,non-verbal and needs 24/7 care which leaves no time for me to get a job to help pay for my schooling. I have been looking online for a long time to try and find some type of scholarships or grants that might help and I have gotten no where! Any suggestions are greatly appreciated!! I’m a sinfle african american mother raising a autistic son! I want to go schoool for Billing and Coding! Can someone help me find scholarships or grants! Any help will be appreciated! Hello, I am a mother of four, a part time student, married and unemployed. them to return at anytime.. I feels that there a better opportunity for me and my family. So I’m requesting if there anybody that can help me with my, education for financial. Hey I am a mother of two kids and have a full time job while still trying to attend college full time. I have exhausted my grant according to the financial aid office and just simply can not afford it on my own. I have just enough to pay for my bills and feed my kids. I don’t know what to do. I am almost finished with the community college so I can transfer to the university in spring of 2013. I just have no money for classes or books for that matter not to mention I live 45 mins away from my college. Please someone help me. I don’t want to quit. Hi My name is Amber and I am raising five kids, two of them I had and I take care of the other three,I work at subway and have been there for seven years and $7.70 doesn’t take care of five kids. So I have have went back to school and was looking for some help. I have tryed to get help from jod and family service and was denied. They said I make to much and I don’t see how but I do it that why I came here to see if anyone knew where I can go and find some help to atlease for school so I can go and finish school so I can have a better job and so I can give my kids something I never had when I so young I wish the best for everyone here. I am a single mother raising three autistic children and want to go back to school for occupational therapy but I don’t know where to look for financial aid help! Any feedback would be much appreciated! In Washington State, your need for grants and loans is determined by the family number. If you are a single mother with a kindergarten child, the family of 2 is assumed to be a husband and wife and your kindergarten child is assumed to be a wage earner. If you have a family of 3, the 2nd child is assumed to be a wage earner. If you have one child in college, your financial award is cut back without noting that someone needs to cover the rent. What is it like in other states? i am a single mother unemployed and in school full time. i am looking for a free grant to help me pay for my tuition, books and living expenses. i am a online student, full time mom and looking for a job each day. i have a gpa of 3.53. i have a bs degree in orginational management and i am working on my ms in human resources. please forward me information if possible. the upper region of georgia is a difficult place to find employment. i have lived here for 1 year and still unemployed and i look each day. thank you. I’m a single mother 27 y of age and have 2 children I would love to be the best mother I can be I just wish I had the education to be financial free its hard looking some one in the eyes and beg for food I just want to have my own.